Also during today’s long journey we had the opportunity to experience in a quite disagreeable manner the ruthlessness with which our Pullman Car was switched at all the crossing points. If a traveler dares to ask the locomotive driver or conductor for a more attentive treatment, he will be laughed at or receives the answer that nobody is forced to use the railway. As a proof of the force and intensity of the blows we received serves the case that nearly all our wine bottles were broken even though they had been well packaged and stored in wooden racks. The incessant use of the locomotive bells that serves as a warning signal gets on the nerves as the sound of the bell is striking similar to that of our passing bell. During the night we passed through the great city of Denver that features numerous industrial companies. In the morning we no longer saw beautiful landscapes or canyons as we were driving Eastwards on the Burlington and Missouri River Railroad through the fertile area of the state of Nebraska, an endless plain. One sees corn and corn again that my please the farmer’s eye but in the length of time appears highly monotonous to the traveler. Numerous artesian aquifers are operated by wind motors and irrigate the fields. The farms and cities show the characteristics of a quick, overly hasty development and discomfort. The private houses are unadorned except for numerous promotions and bill boards. Everywhere agricultural machines replace human labor. Herds 0f cattle and horses are roaming around. In Lincoln, the capital of Nebraska, our ambassador lost his hat and baggage during the switch-over. Here too we received the disagreeable news that we would probably not find the baggage we sent ahead there on the day of our arrival in Chicago. The much praised American railways look quite different if seen up close as when one believes the sugar-coated descriptions. And even in Italy I have not seen similar conditions such as here. Thus there is but a single baggage wagon on these enormously long trains and the baggage of numerous passengers is left behind if there is no space left without informing the passenger and it reaching its destination only 24 hours later. Omaha, „the gate city“, is one of the main entrance way stations to the West and will be remembered for the onrush of the local reporters upon our wagon during our quarter hour stop. When I went out for a short time to catch some fresh air, I could only with difficulties escape from imminent interviews. The intrusiveness here in the service of public opinion I could not have imagined it, even though the American press might have let one expect everything. Liberty of the press is interpreted here as fair game on fellow men whose most intimate private life is spared nothing and made public. The newspapers, from the largest to the smallest gossip rag are full of sensational news, of vilifications as well as spicy stories. In the political arena all means are used. That my person too had to undergo such treatment, that the readers were served with lies and bloopers of the most vile kind, I had to take note with indifference which is the only dignified response for such actions. Near Omaha, the rail track comes close to the Missouri, then follows its right shore for some time and finally crosses it on a high and long bridge which the train, already on the Chicago, Burlington und Quincy Railroad, passes over very slowly. The Missouri is a very languid river with numerous tributaries and dirty colored water. No game enlivened the area. The wetlands however offered a pleasing view as they reminded us of our own wetlands where one can now hear the rutting call of the stags and every hunter is spending the most beautiful hours of the year. Oaks, maples, poplars, willows, in short all representatives of the wetland forests were to be seen here. Forest areas in small submerged grounds or valleys embellished the overall view of the area, even after we had already left the current of the river. ANNO – on 02.10.1893 in Austria’s newspapers. The k.u.k. Hof-Burgtheater is playing the tragedy „Die Braut von Messina“. The k.u.k. Hof-Operntheater is performing the opera „Der fliegende Holländer“. 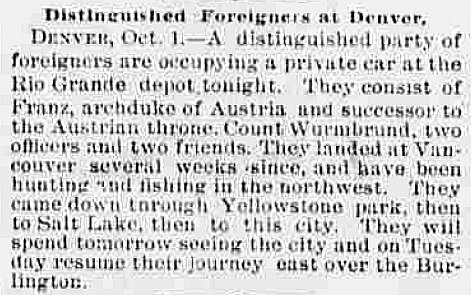 In contrast to Franz Ferdinand’s statements above, at least the digitized Omaha Bee is very respectful about the distinguished if reclusive foreigners. 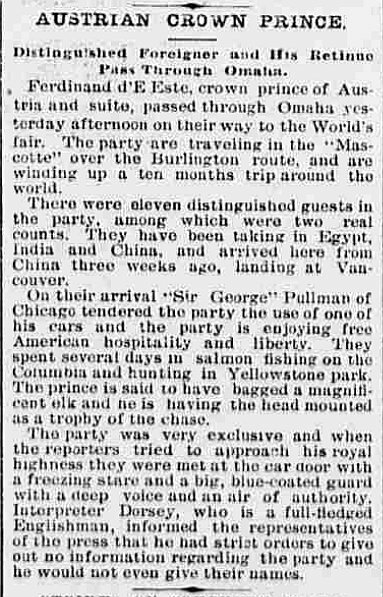 The Omaha Bee 2 October 1893 in the evening edition includes a respectful account of the stop in Omaha. Dieser Beitrag wurde am 2. October 2018 von wordpressadmin in diary veröffentlicht. Schlagworte: Nebraska, October, train, United States.